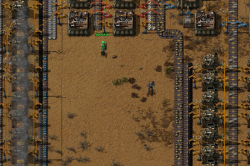 In addition to being a single-player game, Factorio also supports multiplayer, allowing many players to cooperate and assist each other, or work against each other in pvp. This page documents how to set up a multiplayer game, how to join one, and the Multiplayer Admin features for managing other users and the server. By default, multiplayer games run the CO-OP freeplay scenario where all players work together to launch a rocket with a satellite into space. Other scenarios, including PvP maps, are available for download from the Maps and Scenarios forum. Multiplayer games can be joined, hosted while playing, or hosted by a dedicated server. Multiplayer games can be advertised to other players on the same LAN or worldwide. Use the Multiplayer button in the Play menu to start playing a multiplayer game, choose New or Load or Scenarios to host and play, or Browse or Play on LAN to connect to an already-running game. The host can also choose not to advertise the game at all, in which case you'll need the server's (public or otherwise reachable) IP address; you can then Connect directly to that to join the game. All game instances need the installation of exactly the same game-versions and mods. Factorio servers use port 34197. The port can be changed in the config file. Factorio uses UDP only. The game builds its own "reliable delivery" layer built on UDP to deal with packet loss and reordering issues. Make sure you configure your router's port forwarding correctly for port 34197. Make sure your router does not randomize the source port on packets outbound from 34197. Some routers do this and require additional configuration to prevent it. Make sure there is no firewall or anti-virus blocking the UDP-packets. The hard limit for the number of players is 65,535. However, practical limit for this is much lower, popular streamers have managed slightly over a hundred players. As of Factorio version 0.12.0 onwards, a dedicated (or headless) server can be started using the --start-server command line option. You can run factorio --help to get a list of all command-line arguments that Factorio accepts. 0.13 onwards expects --start-server to be followed by a path to a save file. Example files for each of these parameters are included in the data subdirectory. See Console#Command_line_parameters for more command line parameters. Note: Factorio now requires glibc version 2.18, but CentOS/RHEL 7 only ship with version 2.17 so this guide will no longer work without manually compiling glibc 2.18. This step-by-step guide has been verified on fresh CentOS 7 and RHEL 7 installs but should be applicable with little to no changes on most distributions. The guide assumes you will install the headless server under /opt/factorio, adjust paths according to your own setup. We will also suggest that you run the Factorio server as a separate user to harden security of your setup. Note that there are two distinct packages for Linux that can be used to run a headless server. First is the usual Linux download, that contains the full game. The other is the special headless package. The headless package does not contain any files irrelevant for a pure server, such as graphics and sounds. It is also not linked against libraries that may not be present on a server machine, such as Xlib, libGL or libasound. This option should be selected if running in a 3rd party hosted server. You can use a Linux factorio-init script to start/stop your headless server in a much better way. The script will ensure you only ever use the most recent save when your server starts (even if that was an auto-save) while also letting you set a number of other settings like Autosave frequency and Latency settings. This script will also simplify updating the server when combined with a Linux factorio-updater script. As long as it fails saying it cannot find/open the savename.zip you are set! Just upload a save from your own computer and put it in the /opt/factorio/saves directory, or use the --create ./saves/newgame.zip argument. In order to publish the game to the matching server, Factorio needs to be given some more information than just the save file location. These information are provided in a server settings file. To create a server settings file, look at the example file located in data/server-settings.example.json in the Factorio Application directory. The recommended way is to make a copy of this example file and edit the copy. Allows you to limit the number of players that can be connected to the server at the same time. If you want no limit, just set max_players to 0. Visibility for server browser: May be either public, LAN or hidden. Public: The server will appear in the public server list. This requires the login credentials below to be filled in. User credentials using a username and password or authentication token (found on the factorio website or in the player-data.json): These are necessary if you wish to make the server public. Otherwise, they can be left empty. For security reasons it is recommended to use authentication token as this document is stored as plain text. Though it should be noted that an authentication token is a sensitive piece of information as well, and you are well-advised to keep it secret. The key for console commands is also used initiate chat in multiplayer. To execute a command instead of chatting, you need to type /c before the command. Commands executed are visible to all players. Additionally, the multiplayer game must have been started with commands allowable for commands to work. r, g and b are for red, green and blue respectively (possible values are between 0 and 1, use this site to convert colors to rgb numbers). a is alpha channel aka transparency of the color to the base texture. As of version 0.13, players no longer necessarily have to port-forward to play with others. Players may join each other through Steam, or by just the port-forwarded host. Joining by directly inputting a public IP and port into Factorio. Selecting the server from the active public server menu. Playing a local LAN game. To join a multiplayer game by IP, you will need to know the public IP of a valid server. You can find this through social media, websites, or by word of mouth. After acquiring the IP and port, simply go to play -> Multiplayer -> Connect to server, and provide all the information it asks for. If the server has been set up correctly to accept public connections, you should be able to join the game. Factorio's devs keep a list of all public servers that declare themselves to the service, allowing players to join directly through Factorio. Most of these servers will be password-requiring, but many completely public servers can be connected to. To join via server list, go to Play -> Multiplayer -> Browse public games. Provide your Factorio.com login if asked, and a list of public servers will appear. Simply select one. Steam provides a "game invite" system, simply use that to join. You can find more info about how to use steam in it's documentation. This is the most recommended way for the average player to use multiplayer with their friends, as it allows Steam to handle everything. If you have some friends on the same internet connection as you (in the same building or network), you may play a LAN game. Simply go to Play -> Multiplayer -> Play on LAN. Use the multiplayer board in the forum. Many players use other software like Evolve to meet other players. This also has the "advantage" of creating a virtual LAN among the players. See down under software. Some also use Steam to find other players. There is an external server browser with various search options. Tell your friends to buy Factorio, then play with them! Factorio requires that the server (in client-server mode) have a publicly accessible IP address or that all players are on the same LAN. If you are behind NAT, you must set up port forwarding (see above for port number) or use virtual LAN software such as Hamachi or Evolve. Multiplayer games will be launched in client-server mode (also multiplayer forwarding mode). In this mode, all clients send their network traffic to the server and the server forwards the traffic to the other clients. The advantage of this is that it allows games where some players are inside a LAN and others are outside. The disadvantage may be slightly more lag as packets must travel an extra hop (through the server). In PvP mode, players can be on different forces. Each force can have one (free-for-all) or more players (teams). Each force has its own independent research progression. Additionally, each force's turrets and combat bots will attack other players as enemies, unless a cease fire is set. Note that, depending on the scenario, cease fires may be unidirectional — setting a cease fire with an opposing force does not guarantee a cease fire from them in return. To start a PvP game, you can select the 'PvP' scenario from the 'Play' menu, or download a custom scenario which also supports PvP. After downloading a PvP scenario, you need to move it to your application directory, and create the multiplayer game using the scenario. Download the scenario and place the scenario directory in the scenarios directory within your user data directory. Forces can be manually created via the console. This allows any map/scenario to be used for PvP. This may not be as convenient as a pre-made PvP scenario, as there will be no way for players to turn on/off cease fires other than through the console. Each created force has its own research progression and different forces may attack each other. --Sets the new force ceasefire to the "other force"
Players can pick up items traveling along a transport belt that belongs to an opposing force. Note however that this can't be automated: Inserters will not take items from an opposing force's belts. Belts will connect to each other regardless of force membership, so it's possible to extend an opposing force's belt line, and items will flow to them. It is also possible to side-load into, and place items onto (with inserters) an opposing force's belt line. Pipes (and storage tanks, and pumps, &c) will connect to each other regardless of force membership. For example, it's possible to pump fluids out of or into a storage tank belonging to an opposing force. Players can freely connect and disconnect Copper cables and Red/Green wires from any entity that supports them, regardless of force membership. Electricity does not belong to a specific force, and it's possible to power structures with electricity from an opposing force's generators. Similarly, it's possible to read and write signals into a Circuit network consisting mostly of an opposing force's devices. Because of the potentially immense amount of activity on a map, the game engine utilizes a lock step architecture. All instances of the game run full simulations of the entire world and only player actions are transferred across the network. Multiplayer games were introduced to Factorio with version 0.11.0. The only connection method available was peer-to-peer mode which meant every player had to be able to directly communicate with every other player. In version 0.12.4, a client-server mode of communication was introduced in which the server (either a dedicated one or the player who hosted the game) relays messages to all peers. This means that direct connection between all players is no longer necessary. As of version 0.13, P2P connecting is completely removed. As of version 0.12.0, the game features "latency hiding" mechanics where the game simulates some of the player's actions locally to make some common interactions (such as moving the player's character) more fluid. Not every action is a part of latency hiding – most notably, car or train driving and shooting are not a part of it. Maintainer note: The following history may not be fully up to date, or comprehensive. Factorio's multiplayer has undergone a great deal of small changes since its inception, however this history will provide a rough overview. Added multiplayer server option "Autosave only on server". Deconstructing/canceling deconstruction sets the "last user" on an entity. Decreased the size of connection accept message with lot of mod which could help some people with 50+ mod multiplayer games. Reconnecting to multiplayer game that the player is already in (due to being dropped, most often) instantly closes the previous connection and connects the player. Multiplayer user names can only consist of letters, and -_. characters. Disabled 32bit (x86) multiplayer. All hosts and members must be running the 64bit (x86_64) version of the game. More than 10 players in one game will reduce the rate the game is saved to the server. Username is now set to username setting, not email. Added AFK Auto kick interval to multiplayer host settings (with never as default). When save of scenario is loaded in multiplayer, it's scenario is saved in user scenarios. Added /time command to print the current map age. Added option to host multiplayer game with scenario (it only had new game/load game there). Can specify limit of upload speed when hosting. Server doesn't stop/slow down the game when some client is too slow, stops communicating or saves the game longer than the server. Players automatically quit game after 3 desyncs. Removed the option to enable/disable latency hiding, it is always on on clients (and off on the server). Limit multiplayer player name to 60 characters. Server games are published to the server and clients can browse existing games. Building sound is played also for other players in multiplayer. Improved map download speed when connecting to multiplayer game. Mod checksums are calculated when the game starts and are compared with other peers when joining a multiplayer game. This is to ensure everyone has exactly the same mod in order to prevent desyncs caused by local changes made to mod files. Added --port to specify which network port the game should use, when hosting with --start-server or --mp-load-game. The report of different mods when trying to connect to multiplayer game is now scroll-able when needed. Added --no-auto-pause: When running as a server, --no-auto-pause will prevent stopping the game when no players are connected. Multiplayer broadcast (heartbeats) is done via a single message when not using peer2peer. Further optimizations in size of the Multiplayer heartbeat (message sent every tick). LatencyState is suspended when player is killed (and waiting for respawn) in Multiplayer. Simple mechanism for multiplayer relaying via the server. Less annoying glitches when running and shooting in multiplayer with latency hiding. Multiplayer dropping threshold is doubled during map upload / download. Autosaves in multiplayer are performed at the same time by all clients (interval is set by hosting player). Progress bar is shown when non-responsive peers are about to be dropped from the game in the Multiplayer. Progress bar is shown when other peers in multiplayer are saving map. Revived character (after dying in multiplayer) are placed on the spawn point instead of the center of the map. Mods that don't affect game state are not needed to be synchronized when playing multiplayer game or replaying game.